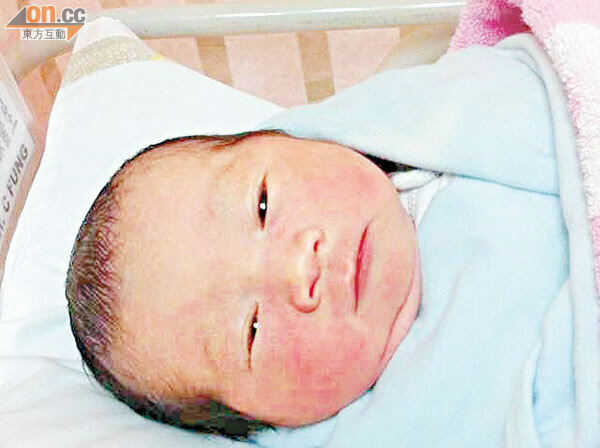 Benny Chan’s (陳浩民)wife, Lisa Chiang (蔣麗莎), gave birth to a 6.6 pound little girl yesterday. The first-time parents named their daughter, Chan Ya Ru (陳雅薷). Witnessing his wife, Lisa, giving birth, Benny’s hands shook and he could not hold back tears. Benny and Lisa chose to have their daughter on the same day as Lisa’s birthday, thus there were two queens at Benny’s house that shared the same birthday! Benny met with the press at 3:20 PM to announce the safe arrival of his 6.6 pound daughter, who kicked her arms and legs continuously. The baby’s grandparents decided upon the baby’s Chinese name of Chan Ya Ru, which refers to one who is well-mannered and equipped with knowledge. Benny and Lisa will choose the baby’s English name at a later time. Benny revealed that his daughter’s due date was originally mid-December. At Lisa’s recent doctor visit, it was discovered through ultrasound scans that the baby’s umbilical cord had wrapped around her neck. Thus, the doctor advised that it was better to have the baby earlier than at a later date. Prior to giving birth, Lisa wrote on her blog that Benny was more anxious than her with the baby’s impending arrival. One month after her post-partum recovery, Lisa, Benny and their family will return to mainland China to visit relatives. Jayne: Congratulations to Benny and hope that parenthood will ground him more and make him realize that family should be cherished. One needs to be responsible and accountable for one’s behavior, as the consequences of irresponsible behavior may threaten the family unity. 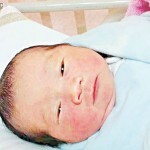 38 comments to Benny Chan Becomes Proud Father of 6.6 Pound Baby Girl! Oh Benny, do not do unto other people’s daughter what you do not want other people to do unto your own daughter. Hopefully fatherhood will teach him to stop drinking in front of pretty girls. it may change him after his daughter’s born,.. i hope so! I agree and really hope that he has learned from his experiences so that bad karma doesn’t go down to his own daughter. @jayne how old are they(benny and lisa)? I think Benny is 41 and Lisa is 25? Rose’s dad is 37 yrs old….!! And Rose’s mom is like 35/36. Her parents had her young. I think Josie was trying to say those wolves who molested Rose are older than her dad. So your prediction is Benny “wanted” to play with Rose like father and daughter game? Okay, saw it wrongly. LOL! Rose is 19 =.= Lisa is 25…. @ Veejay – I know, just wanted to point our her parents’ age. I’d also like to add that because her parents had her young, her dad’s age shouldn’t be used as a scale when it comes to her ‘relationship’/encounters with older men. So benny is gonna call Joe and timmy up to celebrate? Uh oh, the wolves might be on the prowl again soon! Provided Timmy invited some really “naive” chicks over or else, these wolves could just molest the waitresses. I think Benny and Joe will be extra careful from now on after everything that has happened. Hope that they have learned from their mistakes and not do anything like that again. don’t tell me that pic of his wife in wheel chair she is on her way to give birth?. She look like someone going for party instead of giving birth. High boot some more haha…Her outfit really feel uncomfy for someone who’s pregnancy is in 3rd trimester. Totally agree with you. Baby arrives in the right moment (or not!!! !1) to help Benny to recover his reputation with the public. We are soooo cynical!! Congrats to Benny and Lisa! Benny’s smile and victory sign seems to mean something.. maybe it’s just me. Shoul’ve named her “Rose Chan” to always remind him of his wrongdoings and think about his daughter next times he lose turns into a beast. Im sure Joe and BC have been around “taking advantages” of those newbies/young artists for a while, its just that no one reported them so they can just escape like that. I’m also convinced that their wives knew about their “activity” and they just pretend to have their eyes closed as long as they didnt bring home girls. i’M SURE if “these wolves” ever “eat” again, they will probably bring or lure these “victims” to a private where there won’t be any papparazis or cctv hehe. Named the baby to Rose Chan will be a field day in Hong Kong media. The baby is so cute! It’s special that she shares the same birthday as her mommy. Lisa almost looks like Karena Lam in the top picture, just with a longer, pointier chin. That’s what I thought, too. She does look a bit like Karena. Congrat to Benny ,honestly Lisa was more pretty than Rose Chan,that no need for Benny to molest the cheap and ugly girl Rose Chan,even Charmaine Seh is million time pretty than Rose Chan. Grats! Glad the baby is healthy and mommy is doing well. Let’s hope Benny has learned his lesson so the daughter will always see him as a hero as she grows up! Congratulations to Benny and Lisa. Hopefully Benny changes his ways this time around. I like the baby’s name. I think is sound very nice in Cantonese. Congratulations to Lisa for giving birth safely. Glad the baby girl is ok. I’m also glad that Benny gave birth to a daughter so now he knows how it feels if his daughter gets harassed from older men. That will teach him a lesson. He’s too immature and hopefully his daughter will make him grow up. It’s so special having a kid that shares the same birthday as mommy. so special.